One of the things that I cringe the most has always been paying for overpriced Asian food, especially if it's Asian Fusion. PF Chang's? Ugh. Lukshon? Still not interested. Red Medicine? 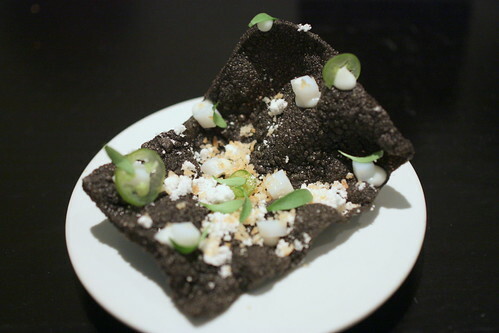 After that mediocre meal at Test Kitchen, my interest in trying Jordan Kahn's menu is at a nil. (That's besides the fact of what happened to SIV, which I found unprofessional to be frank). 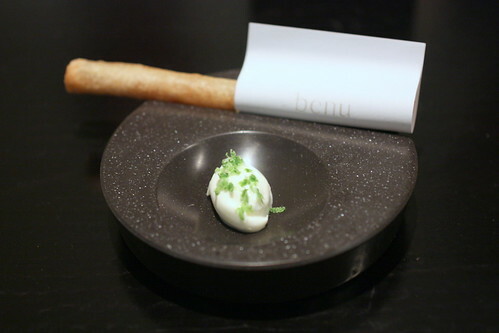 However, Benu has been a restaurant I've had my eye on ever since Corey Lee, the former chef de cuisine at The French Laundry moved on to helm his very own restaurant in San Francisco. Call me a hypocrite, but if Chef Lee was good enough for Thomas Keller, he's good enough for me. 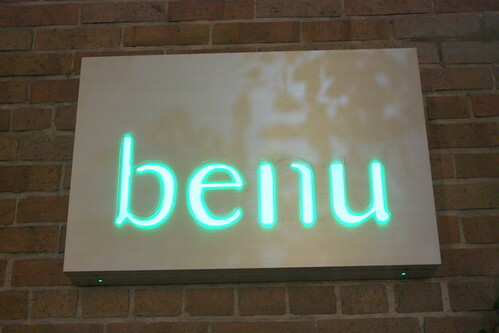 After given the green light from my buddies up North, I booked a tasting at Benu this past weekend. Upon entering the restaurant, I looked at the space. Clean, and modern, just what a restaurant should be these days. 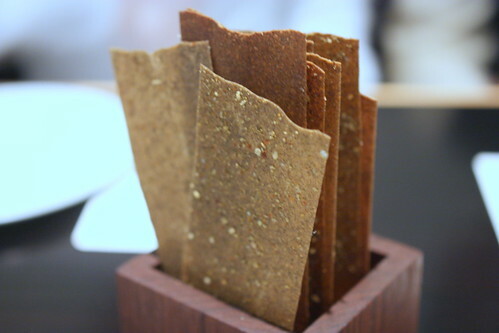 Instead of a bread course, we were given a "basket" of buckwheat crisps. The flavors were subtle, but tasty. Think soba in a cracker form, but better. 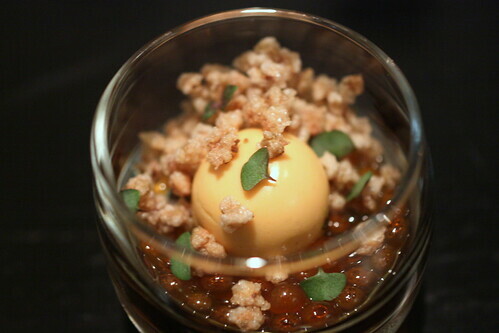 We were started off with a thousand year old egg made with a quail egg. This was something I'm familiar with as it's a common ingredient for us Taiwanese. The presentation reminded me of "Pi Dan Sou Rou Zhou," or a thousand year old egg and minced meat porridge and surprisingly the taste did too. For those that knows the porridge I'm speaking of, think of this as a deconstructed version. An one biter, I quite enjoyed this bite. 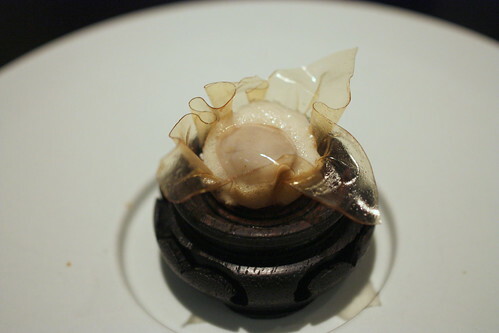 Pork belly, oyster encased in a crispy kimchi shell, similar to a sugar shell. The flavors of all three main ingredients were quite apparent. 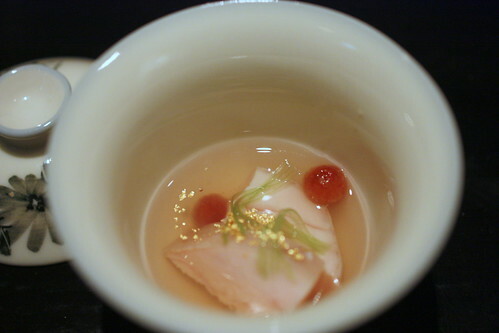 Monkfish liver, or ankimo in Japanese and Salmon Roe are two of my favorite ingredients. Combining the two can't go wrong, right? Right. The liver was presented looking similar to an egg yolk was rich, fatty, and delicious. The salmon roe was fresh and had a nice snap to each bite. This was one of my favorite dishes of the night. The buckwheat added a nice texture contrast to this dish. Next up, a palate cleanser of sort. Refreshing, tasty, but nothing special. Think of this as an eel egg roll. It was pretty good, but I wish there was more to this than eel inside a fried pastry dough. Yes, yes, I don't like fried dough, though I wished there was just something more than a creme fraiche dip. Good dish nevertheless. 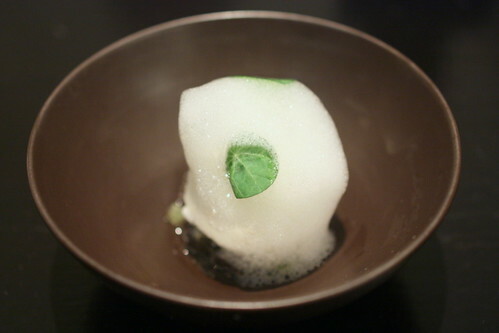 I was told about this dish by Alex, whom I met on a recent dinner at Wolvesmouth and I'm glad I made the substition. This was one of the best things I've ate this year. Sea urchin, black truffles, corn risotto. Come on, tell me that doesn't sound good! I think I would have added some nice sweet crab meat to this, but maybe I'm just being greedy here. 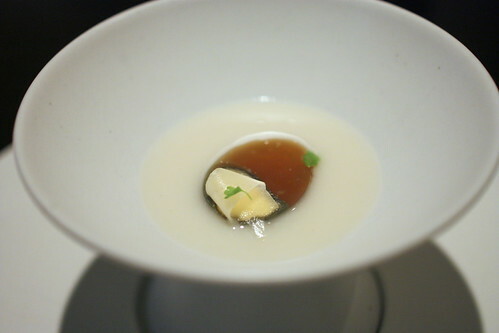 I would have been happy eating 19 courses of this that night, though I might die of some sort of a cholesterol attack. 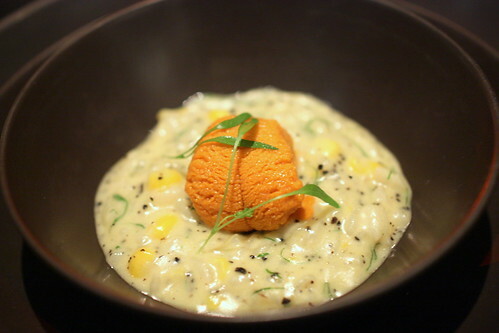 If you do the tasting menu at Benu, make sure you ask for the sea urchin risotto! 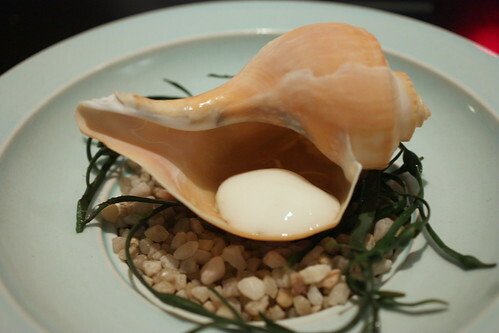 Compared to the risotto dish, the conch was quite light and refreshing. It's almost a conch ceviche, without all the ingredients. The presentation of the conch was a nice touch as well. This dish is a playful take on a popular dish found in many Chinese seafood restaurants. In this case, A crispy squid chip (I think, or it could be shrimp) is presented with chopped jalapeno peppers, green onions, and little pieces of squid. I'm almost tempted to try this at home with some store bought chips. I was slightly weary of this dish after seeing it on the menu. I was worried the jasmine tea flavors would overpower the chicken. Thankfully, I was wrong. 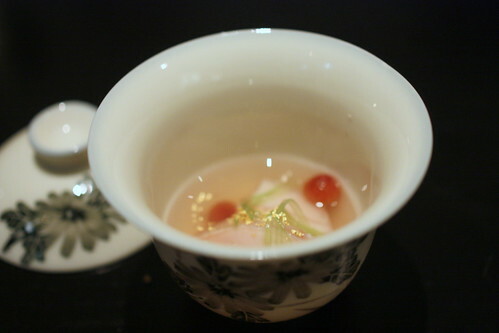 The jasmine tea flavors was spot on, with a hint of sweetness. The chicken itself was done beautifully. It came out moist and sweet, it was definitely money! I was looking forward to this course, but I was left slightly disappointed. While the skin was done quite nicely, in fact, a lot better than I had expected, I was hoping the foie gras be more dominant in this dish. 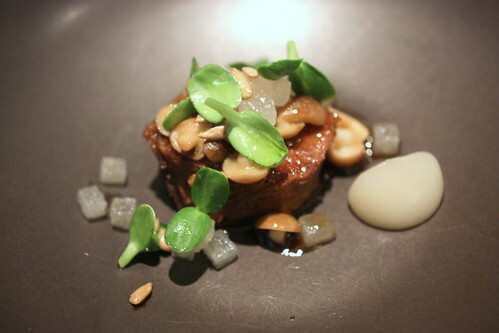 While I tasted bits of foie gras, the filling and the juice lacked the strong rich flavors of the foie. As the table pointed out this being one of their favorite courses of the night, I can't help but agree, it was quite tasty. 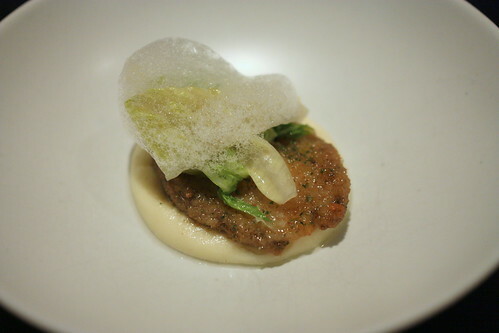 The abalone was fried, similar to a Taiwanese chicken cutlet and was served on a bed of potato puree. The abalone was very nice, I would never have thought to fry an abalone. I wonder how this would taste if it was on a bed of minced meat rice Taiwanese style with some sour mustard. 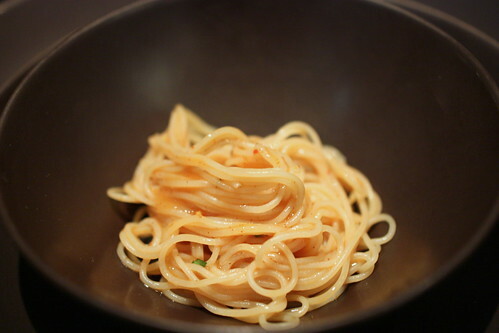 At first I was a bit surprised the noodles came nary of ingredients, but the flavors of the shrimp roe was quite apparent once you take the first bite. Rich, succulent, and all in all, one of my favorites of the night. 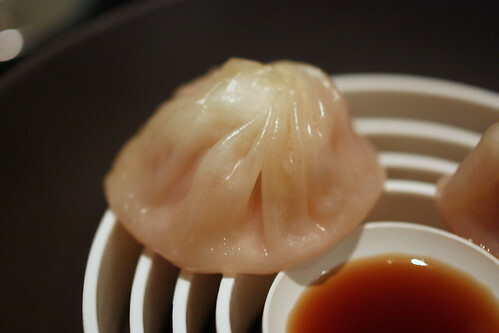 Like with the foie gras xiao long bao, this too I was waiting for, but with much better results. 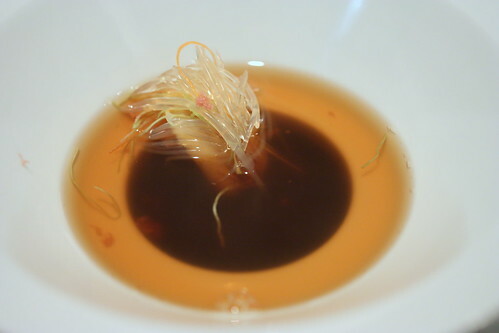 Although the star was supposed to be the faux shark fins, I loved the broth made from the Jinhua ham and the crab and truffle custard were bordering on insane. It's almost as good as the Chinese version you get at banquets. I'm biased, sue me. Another winning dish, in fact, probably my second favorite course of the night after the risotto. The duck was cooked perfectly, and tasted like a beautifully roasted duck. 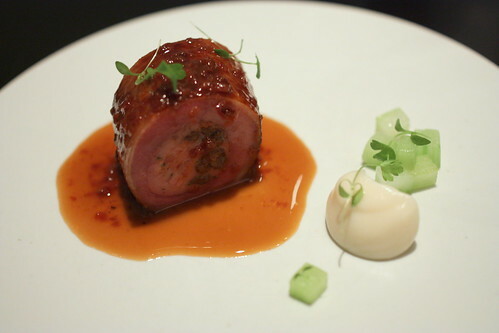 The duck itself was stuffed with a duck mousse, make its flavors and texture even more intense. Very, very nice! The beef, short ribs I believe was cooked fork tender. The flavors were spot on and I enjoyed the accompanied mushrooms. While it's not as good as the duck, I thoroughly enjoyed the last savory course of the night. 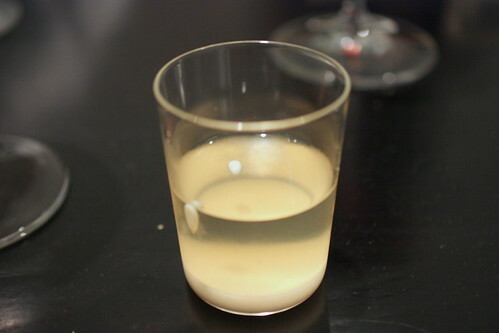 This first dessert reminded me of shik hae, a Korean sweet malted rice drink, but the version at Benu added this silky panna cotta on the bottom which was quite nice. I found this to be quite light and the balsamic vinegar was used very nicely here. 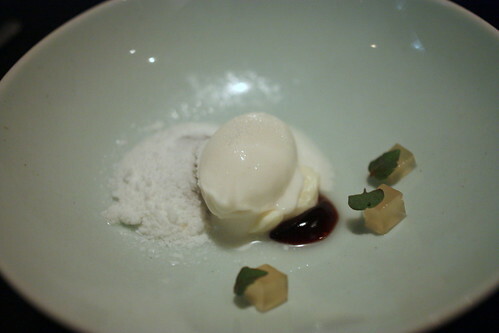 The white chocolate ice cream wasn't overpowering and countered the fig quite well. This was richer than I had expected, but tasty nevertheless. 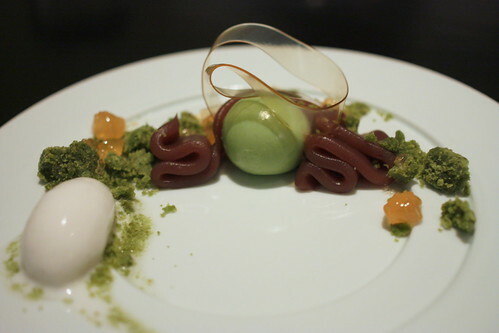 My favorite part of this particular dessert was the lychee ice cream and the matcha custard. This was definitely an Asian influenced dessert, trending towards Japanese. 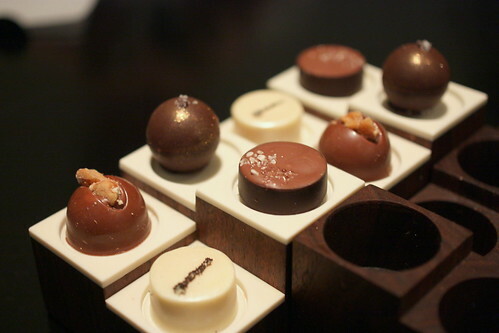 Finally, we finished our meal off with some chocolates. My favorite piece of the night was the passion fruit white chocolate. That was quite tasty! All in all, Benu either met or slightly exceeded my expectations. I was expecting a good deal of Asian flavors and I got it. Chef Corey Lee's skills was apparent. The flavors, the presentation were top notch. The wines we had paired during our meal were strong and I especially liked that Riesling we had to start the meal. The questions everybody wanted to know was did I like it and would I return? The answer would be Yes to both, but with the abundance of fine dining around the San Francisco Bay Area, I'm keen on trying the other places first. Comparing a place like Benu to Lukshon would be a disservice to Benu as it's on an entirely different level. 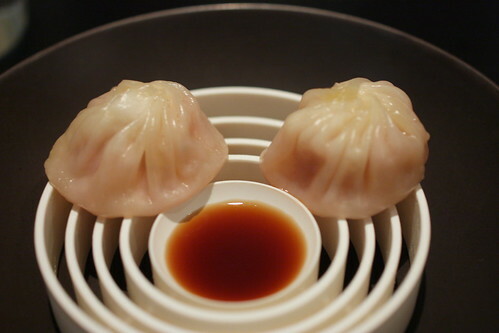 While I still wouldn't pay to dine at Lukshon, I would happily pay to eat at Benu. The quality, the skills of the chef, the dining atmosphere are just different. 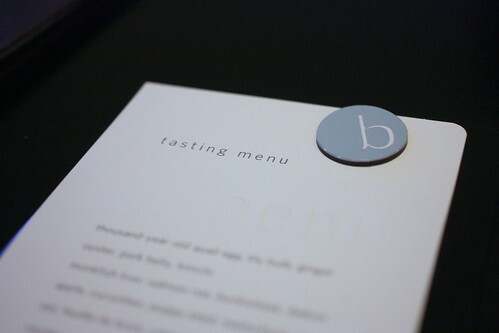 If you're in the San Francisco area, I'd highly recommend dining at Benu. Just remember, make sure the duck and the uni risotto are on the menu. Cheers!